Individual notes within chords are heard with greater detail - harmonics jump right out! 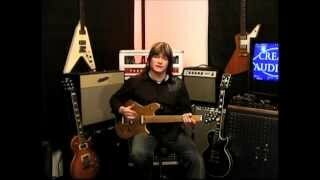 The guitar becomes very responsive to the players picking velocity and strength... This is something you will feel! The timbre of the instrument stays consistent, especially when “rolling back” the volume controls! No loss of high frequencies when you turn down your instruments volume - It's like having a master volume that keeps your tone the same at any volume level. Because the output impedance is less than 300ohms the circuit can easily drive a line input for going direct to a mixer. This results in a clear, full range of tone that sounds better than using a direct box for live or recording applications. Flat frequency response: 10 Hz - 50 kHz! 1. Remove your existing jack. 2. Unsolder the signal wire and the ground wire from the original jack. 3. Place a piece of heat shrink (provided with the Redeemer) over the brown wire of the Redeemer. Solder the brown Redeemer wire to the the signal wire that was connected to the original jack (tip connection). 4. Place a piece of heat shrink over the blue Redeemer wire and solder the blue wire to the ground wire of the original jack (sleeve connection). 5. Carefully heat the shrink tubing over the solder connections. 6. Install the Redeemer jack into the instrument. 7. Use the foam from the Redeemer box to wrap the battery and to keep them from rattling around inside the instrument. The Redeemer circuit is very efficient and has a long battery life. The circuit is turned on by the jack when a cable is plugged in. Do not leave the instrument plugged in while not playing as this will drain the battery.